Earlier this week my son discovered our 3 Born Free books and he adores them. I came downstairs one morning to find him totally mesmerized by the story. And he did not want to do anything except for read the book until it’s very end – he was desperate to know what was going to become of the 2 lions – Bella and Simba. And he did, he read and read, really only taking bathroom and food breaks. Now my son enjoys reading but he is normally the kind of child who will read a chapter then put the book down go and play and possibly come back and read some more in the evening or the next day. So this was unlike his normal pattern. And I must admit watching him read a book cover to cover in 1 day made me curious, so after he finished I also read the Lion book and then the Dolphin book and I was about to start the Elephant one when my daughter nicked it away to read. They are stunning books. Why do we (kids and mom) like our 3 Born Free books? Well my kids are fascinated by animals and they both would love to have a job where they work with animals so these books were the perfect subject matter for them. 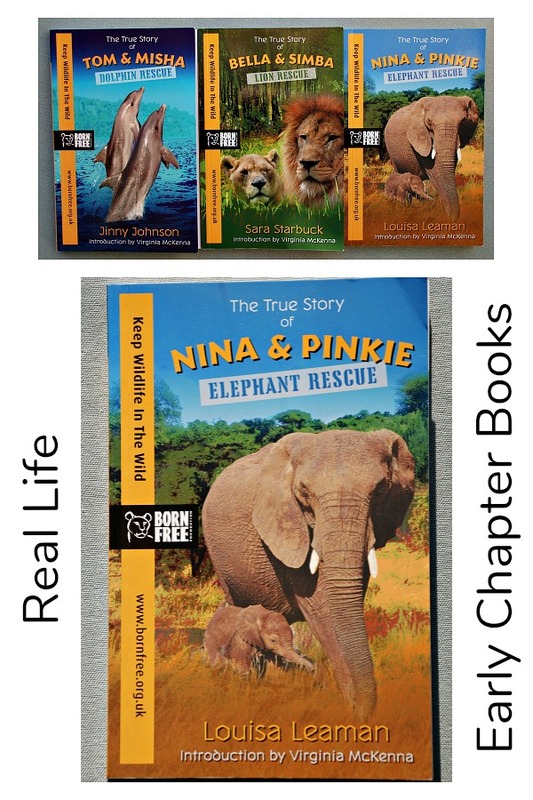 They are true stories written about wild animals that were in captivity and then rescued by the Born Free Foundation. The books are aimed at children but at the same time they don’t gloss over real facts about the animals wellbeing, they explain how the dolphins held in small swimming pools suffer and how lions kept for circus entertainment must feel. The stories also show how rescuing an animal and then rehabilitating it is not a quick process but really takes a long time sometimes with some low moments but that in all stories the rescuers never gave up. and we both liked that fact that each book includes lots of animal facts. I personally liked these books for a number of reasons – the animal facts, the language used extends the kids vocabulary, the emphasis on wild animals belonging in the wild, the multiple examples of people trying incredibly hard to help these animals – people who make excellent role models for kids. And if you search online there are a number of other Born Free books which appear to be in the same format so far I have spotted a Chimp Rescue, Cheetah rescue, Bear rescue, Tiger Rescue – we are definitely going to give ALL of them a try. I have included Affiliate links. If you follow an affiliate link and go on to purchase that product, I will be paid a very small commission, however your cost will remain the same. I only include affiliate links for products that we use and love. This entry was posted in Book Ideas and tagged animal books, Born Free, children's book, educational books, home ed, home education. Bookmark the permalink. I love it when you give book recommendations from you son because I have a boy just younger than yours who seems to have similar tastes, so we’ve been reading everything your boy reads just after he does, and it is GREAT! That is so nice to hear. I am glad you find the book posts useful. I must be honest it is one of the areas that I struggled with (finding good reading books) as mine are not that keen on the wizard stories / anything too scary or dealing with underworlds etc so I get excited when I find a good set.